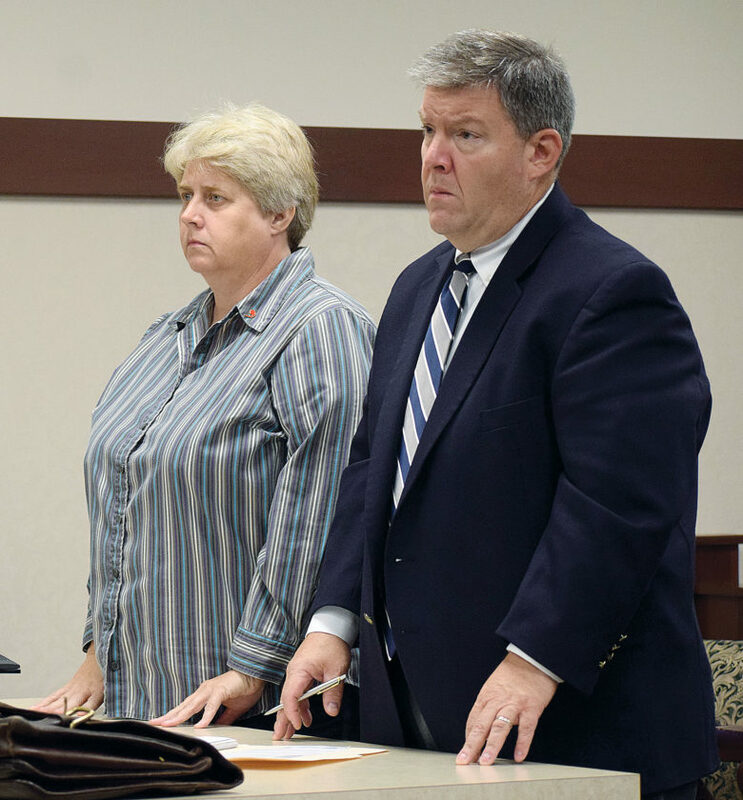 PHOTO BY JILL GOSCHE Kim M. Tyler (left), a former employee of Tiffin Metal Products, stands for sentencing next to her attorney, Dean Henry, in Seneca County Common Pleas Court Judge Steve Shuff’s courtroom Friday morning. A former employee of Tiffin Metal Products was sentenced to prison Friday morning for stealing more than $300,000 from the company. Kimberly M. Tyler, 52, of Tiffin, waived indictment and proceeded with a bill of information charging her with aggravated theft, a third-degree felony, and two counts of forgery, both fifth-degree felonies. Seneca County Common Pleas Court Judge Steve Shuff followed the joint sentence recommendation and sentenced her to 30 months in prison. He ordered Tyler to pay restitution of $310,653.97 to Tiffin Medal Products. The total could decrease based on the outcome of an insurance claim. Seneca County Prosecutor Derek DeVine said Tyler was hired as a marketing manager for Tiffin Metal Products. The theft occurred over three years, he said. After the hearing, DeVine said Tyler would use her personal credit card for business-related expenses, such as trade shows and travel, and would get reimbursement. She submitted fake claims and has been fired, he said. Tyler would be eligible for judicial release after serving six months in prison. She declined to make a statement before sentencing. Her attorney, Dean Henry, requested Shuff adopt the sentence recommendation.